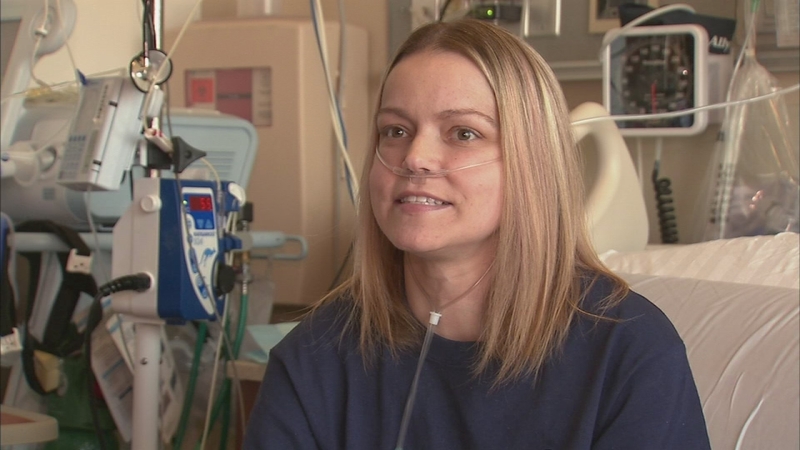 Kemberly Richardson has the story of a woman from Queens who is at the center of the viral campaign as she awaits a double lung transplant. NEW YORK CITY -- A woman from Queens is at the center of the viral campaign as she awaits a double lung transplant. Now, #OomphForKaty is making waves across social media, with everyone from celebrities to average folks doing there part to offer a pick me up. Seeing pictures and videos of people using the hashtag serves as daily motivation for Katy Starck-Monte, who is just trying to make the most of a bad situation. "I feel like I've been dealt a really crappy hand," she said. "I'm kind of doing the best I can with what I've got." When Katy was just 13 months old, she was diagnosed with cystic fibrosis, a genetic lung disease. "My lungs are killing me," she said. "My whole body hurts, but this is how I've felt. I'm kind of used to it." Katy had a double lung transplant in 2011 and thrived at first, but then her body began rejecting the organs. Now 30, Katy are her husband Joe, a New York City firefighter, spend most of their time in the hospital, where Katy waits for another transplant. And then came the growing campaign, #OomphForKaty, that keeps her fighting. So many strangers prayed for Katy and sent cards that her friends turned to social media, and then, even more well wishes began pouring in. Celebrities and people all over the world chimed in, rooting for a girl from Queens. "It's overwhelming, and it just makes me feel positive and makes me have good days," she said. "There are so many people behind me." And in front of her is a mural of messages, all with that same hashtag. But in order to live, Katy, the youngest of five, must have that second procedure. "Despite all the therapy we can give her, she's not going to improve until she has the second transplant," said Dr. Lori Shah, of New York Presbyterian-Columbia Hospital. So she continues waiting for another set of lungs, which is the driving force behind all of this. "I want people to know about (cystic fibrosis), people to know about organ donation," she said. "That's really it. I don't want money, Ii don't want anything. I just want awareness. I want lives to be saved." But the one person Katy is hoping to get a post from is actress Blake Lively. We'll keep you updated. Three years ago, Katy made a video that she hopes will spread the word about the illness and the lives it has claimed.